Welcome to the Fifty First Edition of the Owen Guns Bulletin. External Ballistics Calculator for all Components,Not Bullet or Powder Brand Specific. 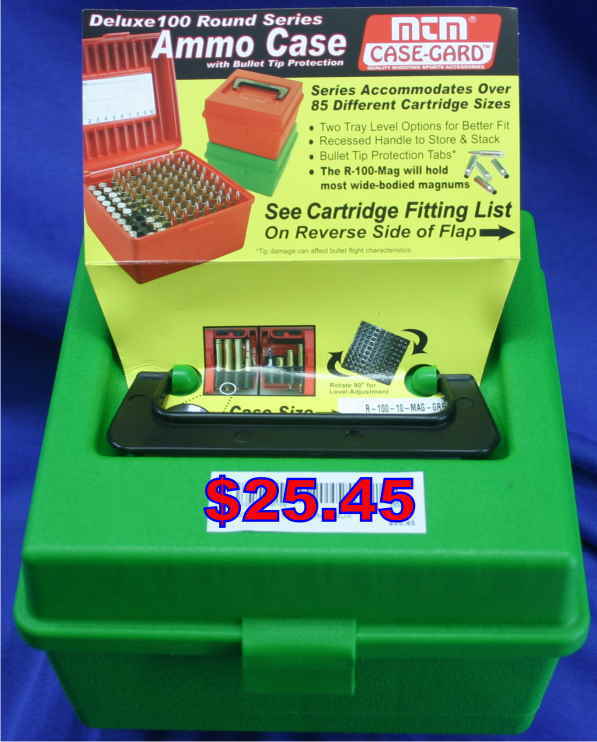 MTM Case Guard boxes capacity 100 cases will accept Super Short Magnum cartridge cases. $25.45 per box plus post. Thompson/Center introduces the New T/C Venture, the most value-packed bolt action rifle available on the market today. Designed to deliver top end quality and accuracy at an entry level price, the Thompson/Centre Venture offers a 5 R rifled match grade barrel and match grade crown, adjustable precision trigger and a classic style composite stock that puts it in a class all its own. A rugged, reliable tool for the outdoorsman. the T/C Venture features T/C’s renowned innovation, craftsmanship and cutting edge barrel technology. Guaranteed to deliver Minute of angle accuracy… 1 inch groups at 100 yards. 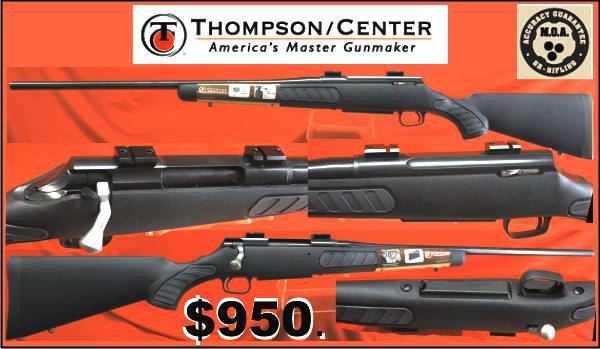 Armed 12 g Under & Over shotgun, single trigger, ejectors, five interchangeable choke tubes the best value in a, new over and under on the market today. 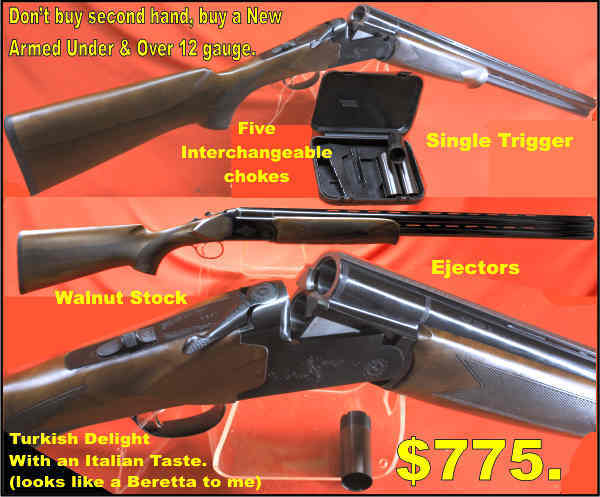 Truly a Turkish gun made with from Italian designs, a Turkish Delight with Italian good taste. 28 and 30 inch barrels at present. Long recoil automatically operated breech actions, in the 21st Century are usually found in shotguns. (except for Australia as there ownership in prevented by extremely restrictive licensing conditions which is almost an outright ban,) Most long recoil semi-auto shotguns are ones based on John M. Browning’s Auto-5 action. In a long recoil action, the barrel and bolt recoil all the way back as a unit. Once its rearward movement is absorbed by its recoil spring, the barrel is forced forward by the spring, where it unlocks from the bolt and returns to battery. The bolt, after compressing its own recoil spring, is held in the rearmost position until the barrel returns to battery. At this point, the fired shell has been extracted and ejected, and a new shell has been lifted from the magazine. The bolt is released by the return of the barrel, and is forced closed by its own recoil spring. Long recoil operated firearms have a distinct “double recoil” feel to them, the “first recoil” being the halting of the rearward motion of the bolt and barrel, and the “second recoil” being the heavy barrel returning to battery. This in fact seems to slow the recoil speed, distributing the recoil over a longer time period giving the shooter a less noticeable sharp knock. These properties for shooters with a shoulder disability give decided advantages in pain management, assisting to keep the shooter in the sport for many years after he, or she would have to retire. The A5 design was patented in 1900 by John Moses Browning, the long recoil action is now over 110 years old, and has dominated the automatic shotgun market for nearly a than century, before it was supplanted by new gas operated designs. While Browning halted production of the Auto-5 design in 1999, Franchi still makes a long recoil operated shotgun line, the AL-48, which shares both the original Browning action design, and the “humpbacked” appearance of the original Auto-5. 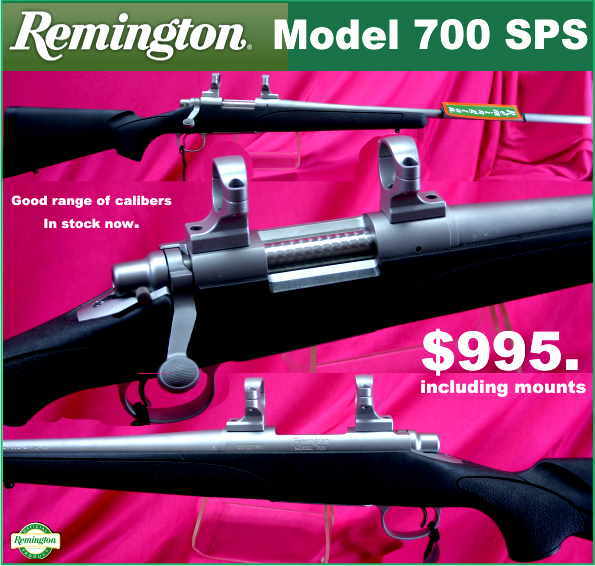 Other firearms based on the long recoil system invented by John Browning were the Remington Model 8 semi-automatic rifle (1906), the Frommer line of pistols (1907) and the Chauchat machine gun of World War One. Although the Long Recoil Auto action has one of the best reputations for reliability in the world due to the genius of Browning, the Chauchat light machine gun was a sometimes working gun, as the French made light machine gun had the worst reputation for reliability in the firearm world, which still may not be surpassed. With all the Long-Recoil Operated Actions the barrel and bolt recoil all the way, solidly locked together. As they do so, they compress their respective return springs. When recoil is completed, the bolt is caught by a catch. As the barrel begins to move forward, it is unlocked from the bolt, which remains held to the rear and which in turn holds the empty case. 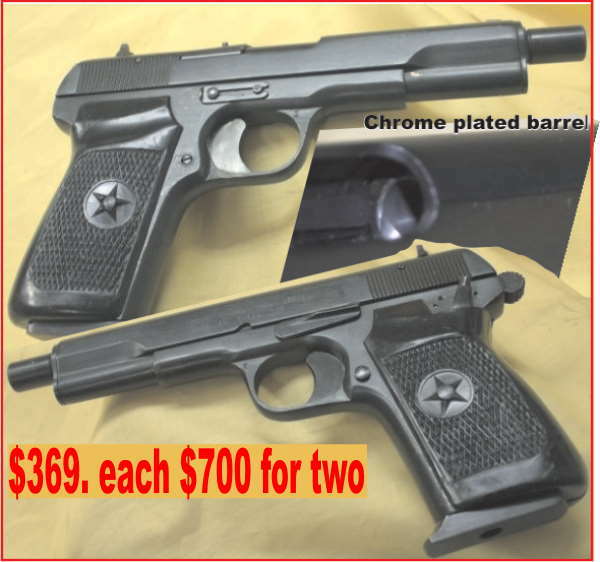 In this type of firearm, extraction takes place as the chamber is “pulled off the case,” rather than as the case is “pulled out of the chamber ” When the barrel is almost fully forward, it trips the catch, releasing the bolt. In the shotgun, the carrier mechanism serves as part of the catch. In 2008, Canada had a total of 611 killings. 200 shooting homicides, almost all gang related with black market guns. 14000 hits (of checks) on the nationwide gun registry (according to Canadian Police) and not 1 data base hit (check) saved a life. 200 stabbing homicides, almost all gang related with knives. Zero hits on a non-existent knife nationwide registry. 200 beatings, strangulations, burnings, almost all gang related. Zero hits on a non-existent beatings, strangulations, burnings nationwide registry. 14000 hits on the gun registry nationwide (according to Canadian Police) and not 1 data base hit saved a life at a cost of 2.4 BILLION DOLLARS. With those kind of statistics it’s no wonder legitimate sportsman no longer support the Canadian Association of Police Chiefs and the Canadian Police Association. Consider that prior to draconian gun control laws and registration of long guns, support from sportsman for the police was extremely high. Since the Canadian Police supported the NDP, the Liberals and Wendy Koo-Koo’s Coalition for Gun control, it’s plainly obvious the Police associations are not concerned about the police support from 7 million legitimate sportsman in Canada. Why would hunters and target shooters support the police who have made legitimate sportsman the scapegoat for crimes committed by street gangs involved in the lucrative trade of illegal drugs. This all could be said about Australia where the Police and legislators refer to firearm owners and dealers in the same terminology as drug users and dealers. Support for the police?…not bloody likely! “The long gun registry makes sense because we register cars, don’t we? It peculiar these sort of lies all end with a question. I believe it because the liars that use them know they are a lie. All classic sports cars, subcompact cars or cars capable of operating in excess of 120 km/h would be totally prohibited. Cars that look like they are capable of exceeding 120 km/h but are not would also be prohibited by adding them to the list of prohibited vehicles. Persons owning such cars prior to the enactment of the every changing “Traffic Act” would have to hand them in for the latest destruction program. Buy back money would be promised but due to the treachery and corruption of the staff running the program you will miss out. Some special people could keep theirs for assisting in a disability or special need. They would require a “special authority to drive” to take them to a provincially certified track to drive. The government, by virtue of a legislative screw-up, would never be permitted to grant the special authority, due to another unrelated Act. Replica’s of those cars capable of 120Km/h even though they have no engine or wheels that turn are also placed in the same category and have to be handed in or held on a very restricted special licence, which includes extra security provisions. All two-door sports cars, by virtue of being two doors, would be banned from driving on roads and would be restricted to use of provincially regulated tracks. To take your two-door car to the track would require an authorization to transport to the track. You would have to take a designated route to the track. If you deviate from the route, you could face serious criminal charges. 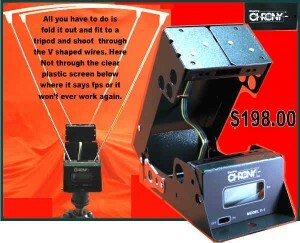 This would also include all the replicas or anything that looks like a sports car. If you own a car, any car, you would have to store it in a locked garage. If you do not own a locked garage, you would have to drain the fuel tank after arriving home, and lock the doors. You would have to store the petrol separately from the car, and in a safe manner. You would also have to follow this regimen if you parked at the mall or at work. Failure to adhere to this could result in serious criminal charges. The same would apply to Golf buggies and Ride on mowers with an engine greater than a horsepower. Failing to get a registration sticker every year on time would result in serious criminal charges (instead of a fine or a suspended ticket). Any infraction of the Highway Traffic Act would be a serious criminal offence. To get your license you would, in addition to passing a safe-driving course and exams, provide three references who would vouch for your ability to drive. You would have to get approval from all your sexual partners who have stayed in your home, as well as any former employers. Upon receiving your license, you will be allowed to purchase a car, but not on a Saturday afternoons or Sundays, and sales between individuals could never occur. If you do not receive your license renewal on time, police will show up at your door to demand that you turn over your car for destruction. You could also face serious criminal charges. You would be surprised with on the spot inspections of your cars security, at anytime of the day and night. Of course any lack of security precautions and your car will be destroyed and you will be charged and prosecuted. If you argue with your wife, or are going through a divorce, and your wife or partner makes any claim of criminal action, police will seize your car and destroy it. If you are convicted of any criminal offence, swearing on the phone, or an illegal gambling night to raise money for your favourite e charity your car would be seized and destroyed. If you violate any regulations under the Traffic Act or commit any criminal offence, you would have all your cars seized and destroyed, and you would be prohibited from owning a car for 5 years. Every time there is a serious accident or a hit and run, grandstanding and shamelessly uninformed politicians would demonize car owners as dangerous, wife-abusing rednecks who cannot be trusted, and call for a total ban on all cars. If it saves even one life, it’s worth it, right? Hope no one thinks this is funny, as we smile, in South Australia the Police Minister who are steadfastly working to give everyone the benefit of National Gun Laws are introducing a set of changes which will alter the category your firearms are in, as soon as its legislated in South Australia in past experience we can expect it imposed on the shooter of all States. 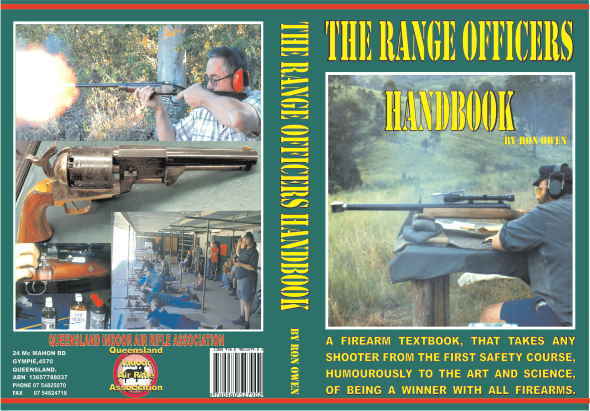 If you do not want to lose your guns or fight to stop the categories being changed on your licence find contact the Shooters Union, www.shootersunion.com.au and complain to the Police Ministers who are going to legislate it, raise yourselves up on your back legs and scream the house down. Another good site is this one. Center-Point Air Rifle Scope and Mount Package, 3-9×40 with objective focus. Easy To Post and with years of use and enjoyment. 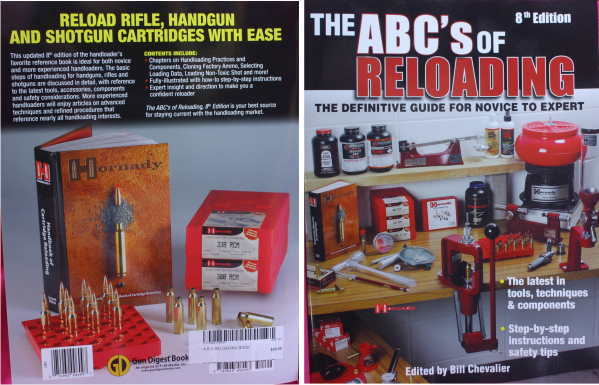 We have over a 1000 Gun Books in stock. $35 . plus $10 post anywhere in Australia. Prior to World War Two in European countries, (definitely not the part of Europe some people confuse with Great Britain), gilding metal (a copper alloy, comprising 95% copper and 5% zinc. Technically, it is a brass) came into common use, but as in wartime and under any British blockade copper and zinc was hard to obtain) steel was explored in much more detail. Steel bullet jackets were brought to a high degree of development, and during WW II, most German small arms ammunition utilized steel jackets. Generally, such jackets were drawn from a very soft steel and then simply plated or given some other protective coating to prevent corrosion. At the same time, methods for applying a thin coating of copper or gilding metal were developed. While electro-plating was successful to a degree, best results were obtained when a billet of steel was sandwiched, or laminated between sheets of the coating metal and then rolled to the thickness required for jacket-drawing. The tremendous pressure and heat involved bonded the coating metal securely to the steel, where it remained in place throughout all further manufacturing operations. Thus, protection from corrosion was achieved as well as a reduction in bore/bullet friction. Today, many European bullets use this “sandwich” jacket material and achieve performance characteristics fully equal to those of gilding metal. Also during WW II, the U.S.A. encountered copper shortage problems and developed similar methods of coating steel for military bullet jackets. Both copper-plating and laminated-type construction were used. In the 1980s and 1990s millions of rounds of 7.62 x 39 ammunition were imported into Australia from China, they were a full metal jacket, and the more modern ones had laminated steel cases and laminated steel bullets, the were a chocolate colour and were referred to many times as “Chocolate Drops”. They were reliable, uniform and accurate and killed well when placed in a vital area. They did not of course, expand as quickly as sporting ammunition but as they had a light alloy insert in the point of the bullet and a harder section below, very often the point would fold over when it hit the target, destabilising the bullet in its terminal stage, the bullet would then form a wedge and penetrate on a much broader front causing a much greater sized wound channel. As the Conventions prevented civilised nations from using bullets designed to rapidly expand, with reduced jacket material at their points the Germans quickly designed their bullets to upset, destabilise, fold, topple and plough through flesh and bone. That was quite lawful and civilised. Within ten years, most or civilised nations of the world had followed suit and copied the design and effect. The only countries in the world where this design was not taken on board was the British Commonwealth countries who after being brought to task were keen not to be accused of war crimes a second time. It is hard to moralise on these subjects as during the two world wars Britain and its Commonwealth forces were criticised for using bullets that wounded, more than they killed, so causing more suffering to the wounded, where the German designed toppling bullet made more severe wounds that killed more reliable. The finger was pointed at the British for wanting to cause more wounded as it caused more logistic nightmares for the opposing army to evacuate the wounded. Yet the wounded have at least a chance of survival, if even it’s painful chance. Keeping in mind that copper always becomes in short supply during wartime, most nations have highly developed methods for producing steel-jacketed bullets, well-tested and ready to put to use. Many military ammunition specifications contain alternate provisions for the use of steel for this reason. It is interesting to note that virtually all small arms ammunition produced in the Soviet Union for the past many years utilizes steel-jacketed bullets. It is only reasonable to assume that we may expect ever-increasing use of steel in bullet jackets in the future. As manufacturing methods become more refined, the much higher price of copper will make steel more attractive to manufacturers. The first expanding jacketed bullets were simple soft-points with a great deal of lead exposed at the nose. Of rather blunt form and driven at relatively low velocities, they expanded well and penetrated deeply, even on the largest game. However, as sharp-pointed designs became necessary for velocity retention, and as velocities climbed, this type became less effective. A blunt soft-point bullet that performed well at 2000-2200 fps will break up badly when driven at 2800-3000 fps. Lead exposure was reduced and cores were hardened to achieve better high-velocity performance, but serious problems developed in that a bullet designed to withstand impact at high velocities at short range would not expand well at, say, 300 yards where velocity had reduced substantially. As velocities and flatness of trajectory increased hunters took longer shots and the problem grew much worse. 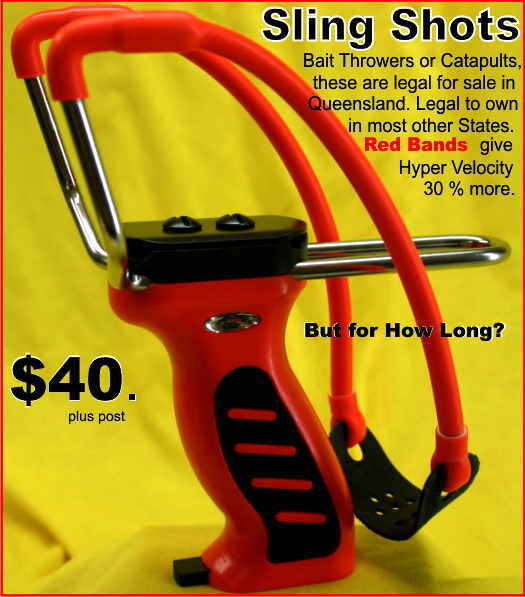 Sling Shots as seen in use on the Streets of Bankock. 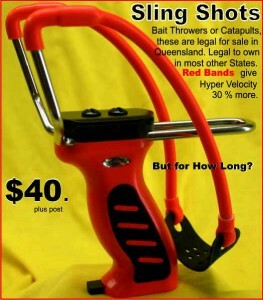 If you cannot get a firearm seems as though these are the next best thing to take on the M16 opposition. Even though they lost the battle for the streets they won points for bravery. 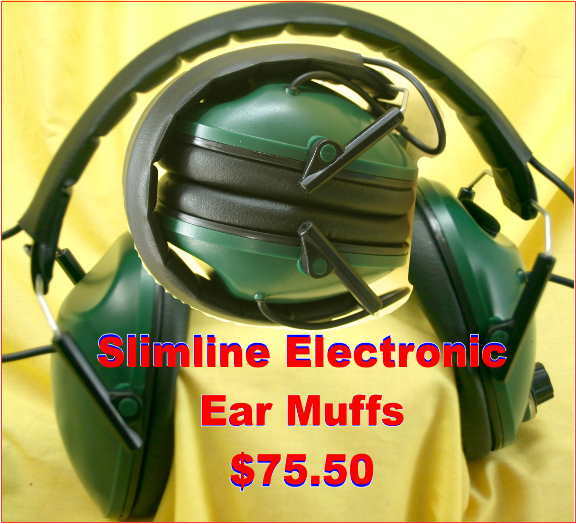 These have an internal magazine for quick loading, Extra effective using round lead musket balls for ammo.